Hello! Welcome to 2018! Man, where did that come from? We're now 18 years after the 2000AD comic was set. I don't know about you, but that blows my mind. Time sure flies! For a while now, we’ve had our heads down working away on our vertical slice (this blog post we did nicely sums up what that is) and have now reached a point where we’re able to demo it to people. This is a big step for us. It's a bit scary watching people play your game but it’s incredibly useful (and satisfying) getting feedback and watching how they tackle the gameplay. Given that we’ve designed the game, it’s kind of impossible for us to test puzzle logic because we already know the solutions (Doh!). In this regard it’s been crucial to see how puzzles are tackled by other people. We noticed that certain things we took for granted were not that obvious to the player. Sometimes it might have been an object that they weren’t noticing, or a combination event that made sense, but we hadn’t foreseen. More often than not, the solution to these issues was a very simple tweak, but without play testing we would never have realised. 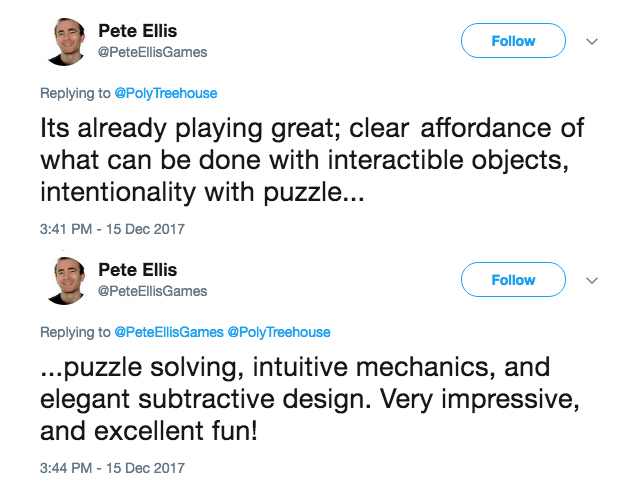 A big win for us was also friend and ex-colleague, Pete Ellis, now at Naughty Dog, playing it and not hating what he saw! Taking the vertical slice to (near) final quality has also helped us prove out a bunch of things and highlighted areas that still need work. For instance we realised during play testing that we hadn’t implemented the save/load system properly. Instead of finding this out months down the line, we can now spend some time fixing it and make sure all the necessary changes are included as a part of our development process from now on - Big win! Moving forwards, we’re now in a position to revisit the design for the rest of the game and push that to another level. This will mean a lot of scratch art and rough design passes that we can iterate and test very quickly. We recently started working with narrative designer, Danny Salfield Wadeson (Hi Danny!) He’s been doing a lot of work behind the scene looking at some of the world and creature lore as well as character development, which we can then start incorperating throughout the game. A lot of our design decisions will be informed by the story we want to tell and the different arcs the various characters go on. We’ve also been looking at different aspects of the music, which we know from the vertical slice (where we’re using off the shelf library music to try on for size) will be crucial to the game experience. We’re keen to have a interactive music system that helps deliver the emotional journey we want the player to have. Basically we’re in a good position to move forward and make the rest of the game, we've just got a lot to do in the months ahead! Looking forward to having you along for the ride!